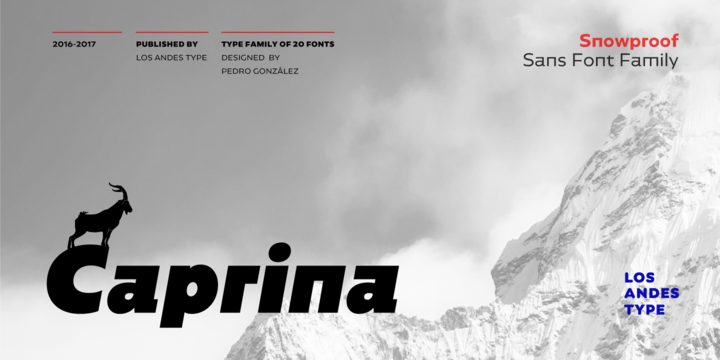 Caprina is a geometric sans serif typeface created by Pedro González and published by Los Andes which was inspired by extreme sports, the greatness of the mountains. It comes in 20 styles, 10 weights and true italics, a wide range of OpenType features and multilingual support. It is suitable for advertising & publishing purpose. Have fun! A font description published on Wednesday, July 12th, 2017 in Fonts, Los Andes, Pedro Gonzalez, PeGGO Fonts by Alexandra that has 2,520 views.